This years Classic TT presented by Bennetts will have added poignancy as Bruce Anstey will ride in the Classic Racer Magazine Lap of Honour in a tribute to six-time TT winner Geoff Duke OBE. The bike will also be on show for all of the Classic TT weekend and Geoff's son, Peter Duke, will ride it at Festival of Jurby. Anstey will ride a 1950 'Works' Norton owned by Mr Peter Bloore and restored in New Zealand by Ken McIntosh and McIntosh Racing, This is the only 1950 'works' Norton in original condition that exists in the world. The Kiwi's 108.110mph lap in last year's Classic TT was achieved using a completely standard, original spec Manx Featherbed frame, which is essentially the production version of the 1950 McCandless design. The name 'Featherbed' was coined by 1949 Senior TT winner Harold Daniel who is reported to have said: - "It was so comfortable it was like riding on a featherbed." Duke described it as the - "best handling motorcycle I ever rode." With a fine-handling Norton perfectly suited to his riding style and streamlined one-piece leathers, Duke and the Featherbed became the unbeatable combination. The new frame and a small increase in power gave Norton a clean sweep in 1950 with a first race win at Blandford followed by a TT Junior/Senior 'Double' and first, second and third places as well as lap and race records in both classes. Duke graduated from being a new and junior member of the Norton 'Works' team to being the leader in a week after second place in the Junior TT behind Artie Bell, and then dominating the Senior TT including smashing the lap record, set by Harold Daniel in 1938. The Norton Featherbed became a production motorcycle using McCandless' design and patents, for which in the early years the McCandless and Bell partnership were paid a £1 royalty for each machine sold. The Featherbed frame continued to be the standard by which all other machines were judged until the 1970s. The only surviving 1950 'Works' Norton was rebuilt by McIntosh Racing in New Zealand using the only original 1950 'Works' frame found at Beaulieu Autojumble by the owner, Peter Bloore and his subsequent 30 year search for the missing parts. Many of the original 1950 parts had seen further service in the later 'Works' bikes and were very difficult to acquire largely because the eight 1950 'Works' Norton's were all broken up at the end of 1950, the parts being used to build the updated 1951 team bikes. The only survivor in modified form was Eric Oliver's 1951 World Championship winning sidecar outfit, which was based on a 1950 'Works' 500. As a result, the bike Anstey will ride took over 2000 hours labour to restore, as every part is special. No 'Manx Norton's' parts are the same as the 1950 'Works', although nearly every part forms the prototype for the production 'Featherbed Manx' which was made for the next 12 years, until 1963. Bruce Anstey will lead the Lap of Honour away joined by Geoff's son Peter who will ride a replica of the 500cc Gilera he won three World Championships on in the 1950's. 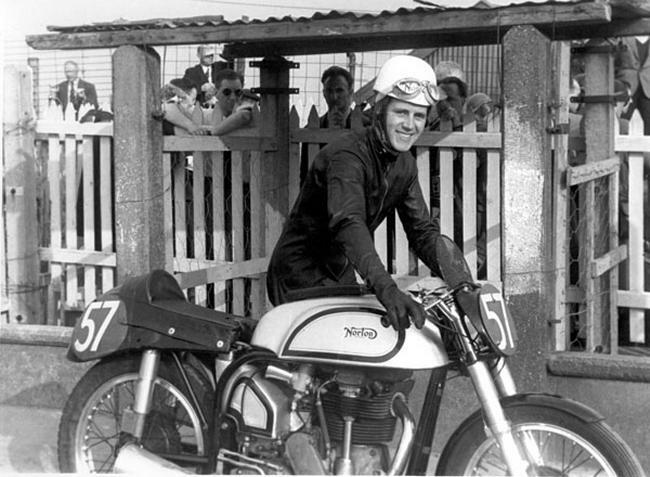 "Geoff Duke is undoubtedly one of the true TT icons and despite his multi world championship wins he will forever be remembered for his exploits on the Isle of Man - not least his remarkable achievements on the works Norton and the Gilera. It is entirely fitting that we pay tribute to Geoff and I am very grateful for the support that we have had from the bike's owner Peter Bloor, Ken McIntosh of McIntosh Racing and the Duke family in creating this tribute." A service of remembrance will be held for Geoff Duke on Sunday 30th of August at St Ninian's Church, Douglas. The service starts at 6.30pm and is open to all. A screen and PA system will relay the service to those outside if necessary. It is hoped the Gilera and Norton will also be on display.